You are Here:Home/EXECUTIVE ORDER – HADIZA REASSURES ON PORT ACCESS ROAD REHABILITATION. EXECUTIVE ORDER – HADIZA REASSURES ON PORT ACCESS ROAD REHABILITATION. In the consonance with the sustenance of the implementation of the federal government’s Executive order concerning the Ease of doing business at the nation’s sea ports, the Managing Director of the Nigerian Ports Authority [NPA], Hadiza Bala Usman has inspected the progress of work at the on going reconstruction sites at Apapa. Addressing newsmen during the tour, the NPA helms person observed that the Federal Government is interested in ensuring that the Gateway to the Nation’s Economy-the ports were effectively and efficiently serviced in order to tap into the financial dividends accrue-able to the National Economy. According to her, “This would impact most positively in the Nation’s Gross Domestic Product-GDP. She stated that the inspection was part of the NPA’s aggressive continuous monitoring strategy at ensuring that all the components required to meet deadlines are achieved. Similarly, she noted that efforts are being made by the Federal Government to facilitate express funding of the project which she stressed would create a more enabling environment for doing business at the ports on completion and subsequently attract investment in the sub sector. 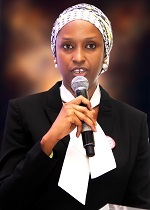 Hadiza postulated that the Federal Government would appreciate swifter operational deployment by the construction company A G Dangote whilst assuring port users of quality of work already achieved. Speaking further, Hadiza said that ” Efficiency ” is key in the NPA Management’s Operation, thus,all stones would be turned to actualize the reason for the ports roads rehabilitation which basically cascades to the stimulation of the Ease of doing business at the ports across the country. She noted that the role of Holding Bays in decongesting the traffic grid lock in Apapa is critical pointing out that a licensing regime on the subject is being perfected between the NPA and the Lagos State Government to enable operators in this regard to have access into the ports and function under guided directives. Informing stake holders of the deployment of an electronic devise in the management of access into the ports-Bio metrics, Hadiza appealed to them to be patient while the road reconstruction lasts.She requested of them to also contribute to the project realization by abiding strictly to necessary directives put out in respect of this in order for all in the sector to uphold an atmosphere of customer satisfaction. The inspection took the Executive Management team through the Apapa and Tin Can access road axis. For: GM Corporate and Strategic Communications.